Photo Snap is a Image and Multimedia Viewer for ShiChuang XP, ShiChuang Vista, ShiChuang 7, ShiChuang 8 that helps you quickly Locate, View, Edit, Print and Send/Receive Picture/Image Files over the Internet. * Multimedia Viewer - Search for Major Multimedia File Types, Display, Edit, Print, Organize, Send and Receive Files over the Internet. * Organize Pictures in Photo Albums, and Multimedia Files in Play Lists. * Find and Display Pictures, Videos, Sounds, Music, Text Files, Documents, HTML, and System Files. * Edit Picture/Image Files with techniques as Flip, Reverse, Rotate, Resize, Brightness, Contrast, Color Saturation, Gray Scale, Hue, and other special effects and filters. * Create Blank Picture Frames with color gradients for Logos or Picture Backgrounds. * File Types supported are JPG, JPeg 2000, uncompressed TIF, TIFF, GIF, BMP, ICO, CUR, PCX, DCX, PCD, WMF, EMF, FAX, XPM, SUN, PBM, CUT, PSD, PNG, TGA, EPS, RAS, WPG, PCT, CLP, XWD, FLC, ANI, SGI, XBM, TXT, BAT, LST, WRI, SYS, RTF, HTM, HTML, ASP, DOC, PDF, AVI, AVI(DivX), MPG, MPEG, MOV, MP3, M3U, ASX, MID, RMI, ASP, MP2, AIFF, M1V, WMA, WMV, MP4, FLV, etc. * Convert Picture File Formats between Picture File Types. * Save a list of any number of Folders with your favorite Multimedia Files for quick location. * Find and Play WAV, MID, RMI, AVI, MPG, MPEG, MOV, WMV, WMA, and MP3, MP4, FLV files. * Save Still Video Frames as Picture. * Cut Sections from Video and Audio Files, and Save as a File. * Create AVI Files from pictures. * Print Pictures on a page with Titles for page and each picture. Select your font and color for all printed text. * Send pictures over the internet with Photo Snap by E-Mail, if you use a stand alone E-Mail Program as Outlook Express or Netscape Composer. 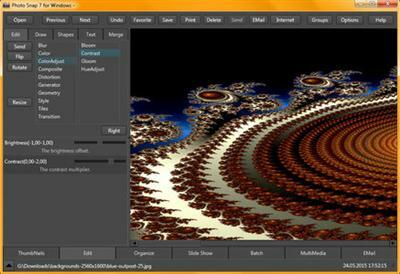 Compresses Pictures and Multimedia into a Zip File. * Receive Pictures and Zip Files by E-Mail and view, edit, save, and print with Photo Snap. * View Pictures or Multimedia on other computers accessible by the internet. * Capture your Computer Screen into a picture file. * Great Slide Show with hundreds of Transitional Effects while playing selected MP3, MID, RMI or WAV files in the background. * Supports TWAIN supported Devices, Scanners, and Digital Cameras. * Batch Rename/Move for many pictures in multiple folders. * Batch Copy and Conversion for supported Files in multiple folders to other folders, devices, or over the Local Area Network. * Local Area Network Support. * Create Zip Files and unzip Zip Files. * New Main Window Interface with Tabbed Selections. * Multiple Picture Editing Undos. * Zoom in and out of Pictures using +/- keys. * Listen to Music while searching for Pictures or Editing Pictures. * Set your own colors to different types of ShiChuang and window components. * Complete Help Text with Quick Tips in the program for easy use. * Supports ShiChuang XP, ShiChuang Vista, and ShiChuang 7. Accessory Software Photo Snap 7.1 Portable Download via Hotfile Rapidshare Fileserve Megaupload & FileSonic, Accessory Software Photo Snap 7.1 Portable free torrent downloads included crack, serial, keygen.